Hiring the right people can make all the difference in your practice. Good employees take good care of patients, and they inspire teammates to excel with their example. 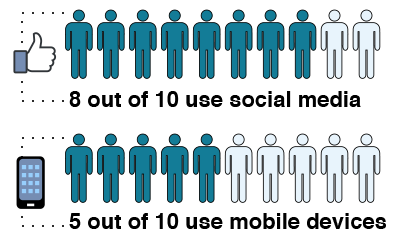 So how can you find candidates who are capable of providing great patient care? How can you determine whether they’ll get the job done right? How can you empower them to solve your toughest problems? Through skillful recruiting, insightful interviewing, and well-planned onboarding. It’s absolutely crucial to take the time up front to find the right employee the first time. This will save you irreplaceable time and expense later on if you have to repeat the process because the person you hired turns out to not be a good fit. Determine where and how to recruit great candidates. Identify techniques, tools, and questions for highly productive interviewing. Pull together the elements that make an effective onboarding plan. As you seek to hire the best people for your practice, you’ll find that the competition is pretty steep. You might be going up against hospitals with more funding and employee advancement opportunities, so your recruitment game needs to be at its best. Now, it’s easy to spend a lot of time and money on recruiting, but that doesn’t always get the best results. So let’s look at some ways you can make your recruiting efforts both highly competitive and efficient. If you have a small practice, you might not be able to compete salary-wise with a hospital or large practice, but you may be able to compensate in other areas. Can you offer part-time work or a flexible work schedule? Do you provide more opportunities for experience and variety through cross-training? Just as you want candidates to put their best foot forward, you, too, need to emphasize all the things that make your practice competitive. First, start with job descriptions that clearly outline the training, experience, and education you want to see in a candidate. Don’t leave this to chance, but spell it out from the very beginning. Make sure you’ve reviewed that job description annually—at least—so that it’s current with what your practice needs. Also, be sure to emphasize the interpersonal skills you’re after in the job posting. For example, does this person need to be outgoing on the phone? Reassuring with children? Gracious with older patients? Or does this position require great attention to detail for billing or claims? Even in the recruiting phase, be mindful that you want to hire for attitude first! You can usually teach skills, but it’s harder (if not impossible) to teach someone the friendliness and respect essential to good customer service, or the flexibility and encouraging spirit needed for true teamwork, or the empathy and compassion vital for seeing things from the patients’ point of view. Second, you need to utilize the most effective job-search sources for a successful recruitment campaign. Post the position internally first. Give your existing employees the first chance at the position whenever possible. Use online sites like Indeed.com, CareerBuilder.com, ZipRecruiter.com, and Monster.com. In addition, Craigslist.org could prove to be your least expensive option. And don’t forget your own practice’s website! Probably most of the people who will be looking for entry-level jobs are millennials, and you need to know two things about where they look: So post your job openings on places like LinkedIn, Facebook, and Twitter. And design them so that they’re easy to read on a phone or tablet. Develop a strong employee referral program. Let your best employees help you find more people just like them! Consider internships. Sometimes schools with medical assistant programs, for example, need to secure internships or externships for their students. This can be a great opportunity to give on-the-job training to someone with little or subsidized pay. Who knows, maybe the person you “try out” will be someone you’ll want to hire! Let’s just say this up-front: It’s okay to be picky! Your goal is to find the best fit possible for your practice, so don’t be too forgiving here. Which responses meet your job description? Did the candidate pay attention to what you’re looking for? If you differentiated between what you require and what would be a plus in your posting, did the candidate respect that? Also, what did the candidate’s résumé and cover letter look like? Do they use the keywords from your job posting? Are they free of typos and spelling and grammar errors? Does the candidate have a professional email address? Is the information up to date? These may seem like small details, but they can actually tell you a lot about how detail-oriented and able to follow directions the person will be on the job. Their initial response is your first clue to who they are. Can you share some tips and tricks about recruiting in your office? Once you’ve filtered through the responses to your job posting and found some promising candidates, it’s time to take the hiring process to the next level: interviewing. There are two stages of interviewing to find the ideal person for your practice: telephone screening and in-person interviewing—in that order. Let’s see what’s involved in these. Telephone screening is an essential first step. This helps you sift out the not-so-good fits and identify the most promising people. If you take care with your telephone screening, you’ll save yourself a lot of time and effort when it comes to the in-person interviewing. What are the elements of a telephone screening? Time: Keep the conversation to 10-15 minutes maximum. State the purpose of the call. Say how long you expect it to last, and ask if this is a convenient time for the candidate to talk. If not, set up a future phone appointment—make sure the candidate can give you their full attention and isn’t distracted. Provide an abbreviated job description, including expectations and hours. 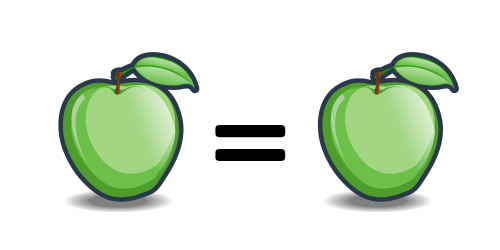 Develop a telephone interview sheet with a standard set of questions for all applicants—remember, you want to compare apples to apples. Take notes about the candidate’s responses on your interview sheet. Ask one behavioral question that would let you see how the candidate would respond to a situation that comes up often in your practice. The rest of your questions can be straightforward so you stay within your time frame. This is so important that we’ll say it again: It’s vital that you handle all calls the same—ask the same questions and provide the same information. This is the only way you can accurately compare candidates. 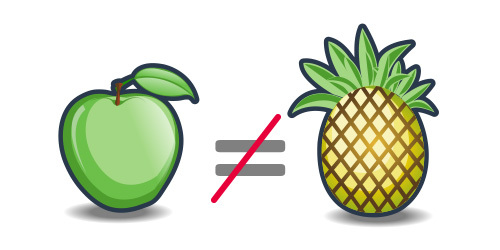 It will be challenging enough to make an apple-to-apple comparison; you don’t want to find yourself trying to compare an apple to a pineapple! Here’s a quick tip: The question “Why are you applying for this particular job?” is always a good one to ask. It lets you see if the candidate has done his or her homework and cared enough to learn about your practice. Just as with any type of interview, nerves are bound to play a role in a telephone interview too. So you’ll want to allow some leeway for that. However, be wary if the person seems too talkative, too quiet, can’t carry on a conversation, interrupts constantly, lacks enthusiasm, or has an unprofessional voicemail message. If an internal warning flag goes up, pay attention to that. Just as with your telephone screening, you want to use the same interview questions with each candidate for consistency and comparability. You can even expand the telephone interview sheet for your in-person interviews so you have the exact same questions for each candidate, as well as a place to take notes. Another helpful hiring tool, in addition to a person’s résumé, is a job application. Where the résumé allows a person to highlight certain information and make an impression with their unique presentation, a job application levels the playing field. Everyone’s information will look pretty much the same, and everyone will be providing the same type of information. So when you schedule an in-person interview, let the candidate know that they’ll need to come in at least 15 minutes early to fill out the application. Then take some time to review it and ask any clarifying questions in the interview. With the in-person interview, you can go deeper and broader with your questions. Definitely include questions that elicit answers revealing a candidate’s attitude, customer service skills, and teamwork abilities. These are especially crucial for a successful hire. Remember, you can usually teach skills if you need to, but you can rarely change someone’s personality. A person may look technically stellar, but if they’re not a good fit with your team, steer clear. Where you only asked one behavioral question with the telephone screening, you’ll want to ask more of these types of questions in person. Start with a behavioral question, and dig deeper with follow-up questions, such as “tell me more about that” or “what did you learn from that?” You can learn a lot about the candidate’s attitudes and behaviors when you go beyond the standard questions. It may be helpful to brainstorm with your team to come up with situations you all often run into with patients or other staff. To help you get started creating a list of questions, take a look at this article: Great Interview Questions for Allergy Staff. As important as your questions are, remember that the point of the interview is to let the candidate do most of the talking. You’re trying to get to know him or her as best you can in a short amount of time. So try to rein in any paparazzi tendencies you might have! And finally, make sure the candidate understands and agrees to all the job requirements. This includes the schedule, hours, responsibilities, location, and so forth. Be sure to address any areas you’ve had problems with in the past up front. You’ve narrowed down your field of candidates to Traci, who comes to you with a terrific résumé, excellent references, and a great phone interview. Now, in your face-to-face interview, it’s time to make sure she’s just the right fit for your practice. Which questions will keep the conversation going and help you learn the most about her? 1. You’re wondering if Traci is goal-oriented or not, so you ask . . .
What kinds of goals have you set for yourself in your previous position? Traci describes the types of goals she has set and achieved in her previous work and goes on to sketch out the future goals she might want to set for herself with your practice. The conversation is flowing nicely, so you keep going. Do you tend to be a goal-oriented person? Traci answers, “Yes, I am.” You and she stare awkwardly at each other, but no more info is coming. 2. You want to learn about how much of a team player Traci is, so you ask . . .
Have you worked as part of a team before? “Yes, I have,” Traci answers. You both nod and smile at each other. And you hear crickets. How have you worked as part of a team before? Traci gives you some examples and describes the different roles she has played, which naturally leads you to your next question. 3. You need to find out how Traci handles conflict on the team, so you ask . . .
Traci politely answers, “No, not really.” She clears her throat, and you twirl your pencil. If you had a conflict with a coworker—say you thought she wasn’t protecting a patient’s private medical information well enough—how would you handle it? Traci pauses to think and then explains how she would work through a disagreement in a respectful and an ethical way. You’re impressed and go to the next question. 4. You wonder how Traci deals with difficult patients, so you ask . . .
Could you tell me about a time when you had to deal with an angry or anxious patient? Traci describes two different situations and how she handled them—and this gives you a new approach you’re eager to try. You two are definitely connecting, and you want to know more. Have you had to deal with difficult patients before? Traci answers, “Yes.” Period. No insights into her here. You take a sip of water to stall a bit. 5. You want to find out how Traci deals with time challenges and multitasking, so you ask . . . Does a fast pace and juggling multiple tasks bother you? Traci says, “No,” . . . and quietly waits for your next move. How do you handle a nonstop day of back-to-back patients along with telephone calls and managing a practice’s paperwork? Traci laughs and says, “As gracefully as possible!” Then she gives you several examples of how she’s dealt with time pressures and multitasking before. Impressed, you go on. 6. It’s important to find out how resilient and flexible Traci is, so you ask . . .
Have you ever made a mistake or failed at a project before? Traci pauses, then says, “Yes, everyone makes mistakes sometimes, right?” She’s looking down at the table now instead of making eye contact. Could you describe a situation where you made a mistake or failed to meet a patient’s needs and tell us what you did about it? Traci frowns a little and explains what happened, how upset she was with herself, how she made things right with the patient, and what she learned from her mistake. She adds that she’s never done that again and looks you in the eye and nods. She is sounding like the perfect fit! Just one more question. 7. You want to learn what Traci values and how she’s grown, so you ask . . .
What are some of the most important lessons you learned in your career? Has your career shaped your values? Traci smiles and says, “Yes, it sure has!” You wait for more . . . but that’s it. You don’t feel you know her any better than you did before the interview and decide to pass on her . . . not realizing that she’s the best fit for the job. What are some good interviewing techniques to assess candidates? What kinds of questions should be avoided during interviews? After narrowing the field through rigorous and insightful interviews, you’re probably excited that you’ve found your ideal candidate! As well you should be. Remember, though, that you have one more key phase to go through before you bring this wonderful new person on board, and that’s your due diligence. Above all, be sure to check references. Take the time to talk with the people who have worked with this person before. Also, do a background check and confirm licenses and certifications are up to date. (Of course, you’ll need the candidate’s permission for the reference and background check.) It’s better to find out now rather than later whether this seemingly terrific candidate has any serious skeletons in their closet. 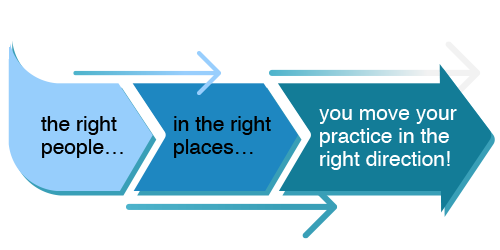 Once everything checks out, it’s time to bring that person on board your practice! So, you’ve recruited, you’ve selected the most promising résumés, you’ve done your telephone screening, and you’ve interviewed your top candidates in person. At long last, you’ve made your decision, offered the job, and hired one of the best people ever to join your practice! Now you’ll want to set them up for success and a long and happy career with you. This is where onboarding comes in. Onboarding is the process of integrating new employees into your practice and preparing them to thrive in their role. This process includes the initial orientation, the training to get them up to speed and confident, and the personal bonding with you and the team. All of this shows the new employee that you’re invested in their future and want them to know that they’re a vital part of the team. Very briefly, though, here are some things you’ll want to put in place to prepare them for success. 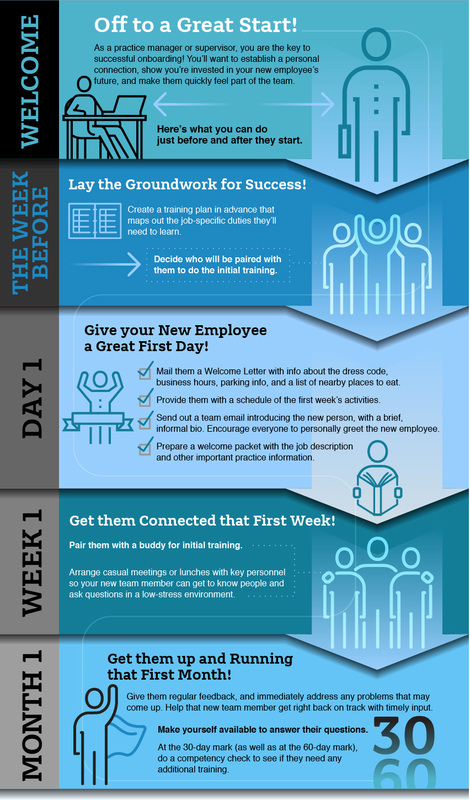 What are some tips to effectively onboard new employees? Pick a few new ideas to use when recruiting. Try using social media or focusing on hiring for attitude. Develop a telephone interview sheet with standard questions and room for notes. Create a list of behavioral/situational interview questions, along with possible follow-up questions. Review your practice’s onboarding process, and fill in any gaps using the suggestions in the module. With the tools and techniques you’ve learned today, you’re well on your way to finding—and keeping—terrific team members! Carolyn Pickles, "Thoughts on Interviewing: You, Attorneys, Staff, and Physicians"
Carolyn Pickles, "Interviewing for Success: Tools Help ID the Best Candidate"
ACAAI, "Great Interview Questions for Allergy Staff"